A few years ago when I created this site, it was really humble with only a few pictures, an ugly background, and no reasons to visit it a second time. Over time, I tried to make the Jeff Gordon Garage better and better, and I learned a few things along the way. Hopefully you've enjoyed it as much as I once DID. The problem is that I have moved on to a new phase in my life and have lost interest in weekly/mid-weekly updates. For as long as Tripod sees fit, The Jeff Gordon Garage will still contain wallpapers, and pictures for you to view and download. As for myself, I'll still be around - lurking the internet and other Jeff Gordon sites. You'll probably never recognize me as the webmaster of the Jeff Gordon Garage, but maybe that's ok. As for yourself, you can visit JEFF GORDON RACING to read up on what's happening in the land of Jeff Gordon on Gordy's web site. Once again, thanks for your support of this website over the years, and best wishes to you. JG Wallpaper - Salute the Champ on your Desktop! I've been waiting too long to make this one, and luckily for you I spent too long making it. :) Well, here it is, after a long wait - The Jeff Gordon 2001 Championship Wallpaper from The Jeff Gordon Garage. Click here to get it now! The #24 team was looking for a win to go along with clinching the 2001 Winston Cup Championship, and looked like they were capable of producing just that in the beginning of the race. However, the car wasn't as strong in the second part of the race, and Jeff Gordon finished sixth. It made no difference though, because all they had to do to clinch the championship was finish 32nd or better. 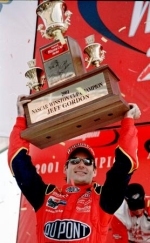 They accomplished this without a hitch, and Jeff Gordon became only the third driver in the history of NASCAR to have more than 3 Winston Cup Championships. ©1999-2002 The Jeff Gordon Garage. This site is in no way affiliated with Jeff Gordon, NASCAR, Hendrick Motorsports, JG Motorsports, DuPont, Pepsi, or any other organizations mentioned herein. For entertainment purposes only. Do not use or reproduce anything from any of the pages on your own page without prior consent of the owner of The Jeff Gordon Garage. Questions? Comments? Drop us a line.